At the suggestion of several bloggers and other supporters over the years, I try to keep my house as a safe zone - meaning there are no food mines in the house to trigger me if when I am having a day where squirrels in my brain are working overtime to get me to pick up. I do not keep my embargoed foods in the house for an unexpected guest. If you are wonderful enough to be welcomed into our home, you are also gracious enough to eat what I give you or you just bring your own food. No one should be kept hostage by their own pantry in the name of hospitality. 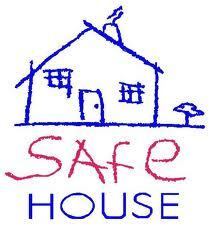 How safe are you at home? Gotta say, 100% safe. I pay for the groceries, I do the shopping, I do the cooking. The only time there is really anything "unclean" in here is when we have our little UFC gatherings every six weeks or so...there will be tortilla chips, potato chips, snack stuff that friends bring over, etc. I don't eat it but I know I could be very tempted if those things were still hanging around the kitchen on Sunday morning. So, as soon as our guests leave, anything left over goes out into the big, dirty garbage can in the garage; problem solved. When people use their kids or spouse as the excuse for buying/keeping problem foods in the home, I just shake my head. I try to keep things out that will tempt me. My kids are still little and like the occasional cookie and sugary cereals. I don't want to deprive them so I buy them their treats on occasion. I use to be really good at avoiding their snacks but it is getting harder and harder! So, instead of buying the regular cereals for them that I love, I have been buying them a much healthier version that I'm not interested in! It is so hard! I agree with everything you wrote. One thing that has always helped me is the gloriously, readily available single servings. So when there is a need for something I don't eat, the others can eat their single servings and then it is all g-o-n-e. Here is the flip side to what you wrote: My husband's mother (died in 2010) thought that whatever she served, I should eat. There was nothing safe at her dining table. Salads were dosed with high fat/sugar dressings, she salted/sauced veggies, she sugared fruit. But because we were at her house, and she served it, I was supposed to eat it. She did not want me to cook my own. Very safe at my house and I don't use the excuse that my kids or husband need those things. They do not need those things and they have gotten use to the way we eat now. Believe me they are not deprived. My kids still get the goodies at school. Someone is always bringing in something at school and kids are happy to share. As long as it isn't coming in my house we are good! Very safe. Few off template foods. They would make me immediately physically ill ( wheat) so not a temptation. A few chocolate bars that are not 85%. Off limits and also not tempting on the worst days. I have been tossing or donating cookie and baking equipment. None of that at my house any more. Makes for more room in my tiny kitchen. All sweet baking has stopped and will not be an option , ever. Good reminder. If guests bring, they take it back with them. Or trash with coffee grounds poured on. Mine is pretty good now. I have an eighteen year old that can eat and would always ask for things. He is in great physical shape and is extremely active. He decided to give up sugar for Lent. He is trying to eat healthier, he will still have to consume loads of calories, but good calories. The first comment (by Norma) gives me a reason to continue this topic a bit on another post because I do have an adult child who lives at home today. She pays rent, buys her own food and is entitled to make her own choices and have her own pantry. Her foods are not my foods. More on that when I publish on Tuesday.